Last year Irene destroyed all my hiking plans by taking down trees and destroying trails with her massive flooding in New England. So this year, having not done any serious hiking for what felt like an eternity, I was a little nervous and felt out of my normal hiking shape. 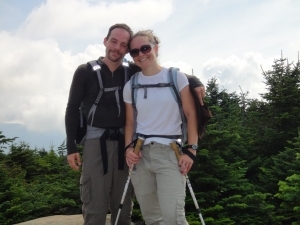 Therefore, when Matt and I were up in North Conway, New Hampshire we did some easier hikes—nothing like Mt. Washington or Lafayette. Instead we decided we’d try to do two 4,000-footers in one day. It turns out covering 4,000 feet is considerably easier than 6,000-feet. It was nice to feel like the hike wasn’t that hard.